Martha Bowman Caudill, 87, went to be with her Lord and Savior Thursday, August 16, 2018 at Helping Hands Family Care in Goldsboro. A graveside service will be held Saturday, August 18, 2018 at 10 a.m. at Wayne Memorial Park in Dudley with Pastor Steve Wellman officiating. The family will receive friends following the service. Mrs. Caudill was born in Catawba County, NC on June 26, 1931 to the late C.A. Bowman and Minnie Pearl Bolick Bowman. Mrs. Caudill was an avid Bridge player while her health permitted and she loved to travel. She was a loving mother, grandmother and great-grandmother and will be missed by all her family and friends. 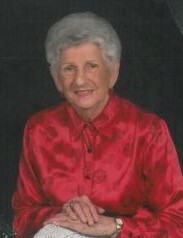 She is survived by her sons, Art Caudill and wife, Nita of Georgia and Steve Caudill and wife, Diane of Wilmington; her daughters, Jackie Baker and husband, Tim of Goldsboro and Cathy Roman and husband, Ralph of Faison; six grandchildren, Allen Baker, Ashleigh Steinmeyer (Chris), Patrick Caudill (Kayla), Holly Caudill, Ryan Caudill and Gracie Caudill and four great-grandchildren, Ellie and Slade Baker and Miles and Jackson Steinmeyer. In addition to her parents, Mrs. Caudill was preceded in death by her husband, Jack Caudill and siblings, A.C. Bowman, Frances Bollinger, Lois Moose and Dorothy Abernathy. In lieu of flowers, the family request memorial contributions be directed to New Hope United Methodist Church, 200 E. New Hope Road, Goldsboro, NC 27530 or Community Home Care & Hospice, 2309 Wayne Memorial Drive, Goldsboro, NC 27534 in memory of their mother, Martha Caudill. Martha’s family would like to extend a special thank you to Community Hospice and Helping Hands Family Care for their outstanding love, care and compassion shown to their mother and her family. The family is in the care of Howell Funeral Home & Crematory in Goldsboro.